As anyone knows who first saw her - an 8-foot bride in bright white gown and face to match, towering over curious passersby in Harvard Square - Amanda Palmer rarely does anything small, subtle, or out of the spotlight. "Who Killed Amanda Palmer," the new solo debut from the onetime living statue-turned-Dresden Dolls frontwoman, is no exception. Leave it to the Lexington-raised singer-songwriter to transform what was initially intended to be a modest, bedroom-recorded album of piano and voice into an expansive treatise on life, death, and dysfunction with pop-piano man Ben Folds at the helm as producer. Add to that legendary string arranger Paul Buckmaster's lush atmospheres, an elaborate art book collaboration with graphic novelist Neil Gaiman, and a series of conceptual film tie-ins with Boston filmmaker Michael Pope, and you've got a side project that, like Palmer, effortlessly claims center stage. What is both surprising and remarkable, then, is how unflinchingly direct, bracingly unfiltered, and wholly intimate the new album, which is out today, sounds and feels. More than Goth melodrama or cabaret theatrics, it has always been the dichotomous contrast between exterior stridency and interior vulnerability that is the Dolls' - and specifically songwriter Palmer's - calling card and most compelling hallmark. 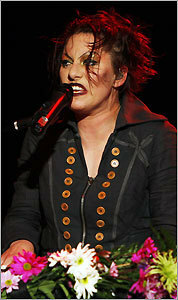 "Who Killed Amanda Palmer," for which she reportedly pared down roughly 30 songs written over a nearly 10-year period, overflows with such moments. There's biting, black humor here, of course: "Oasis," for instance, is a raffish ditty about an abortion that's replete with peppy doo-wop backing vocals and references to booze, bacchanalia, and Brit-pop royalty. But for all the wild mood swings - the clanging, banging piano chords of the album's opener, "Astronaut"; the harried wordplay rush of "Runs in the Family"; the brass-stoked bold swagger of "Leeds United" - it's the quieter passages that are the most emotionally resonant. When she reins in the bombast and her austere alto and looks inward for "The Point of It All," "Blake Says," or the spare portraiture of "Strength Through Music" (written as a response to the Columbine shootings), Palmer's artistic voice fully flowers. With its hauntingly graceful piano figure moving in slow motion over cascading strings, "Another Year" is an affecting ballad that finds Palmer contemplating personal longing and the inexorable passage of time. The song simmers with weary dread but then builds, measure by measure, to something resembling either fragile hope or fatalistic resignation. Either way, it feels like life. (Globe Photo/Robert E. Klein/File) Amanda Palmer of the Dresden Dolls has released a solo debut album.